A farmer once said to me: "you're better having 5 fat cattle instead of ten thin one's." I am very disappointed with some of my cattle this year. Too much Friesian in them and not enough time on the grass. Far too wet since September. Could you not build a temporary shelter to lamb them Kev? I agree with that statement Dave, However I don;t think ten would have done better than 30 here I think there was something else missing as they had plenty of grass for a long time. 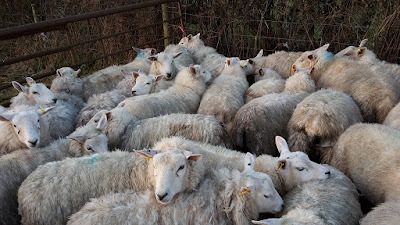 We culled our flock drastically late last year, and now have eight ewes and one ram which is a much better number to have on our land, although we still have to supplement their food during the winter. But a smaller flock is much more manageable for us and we can look after them better. 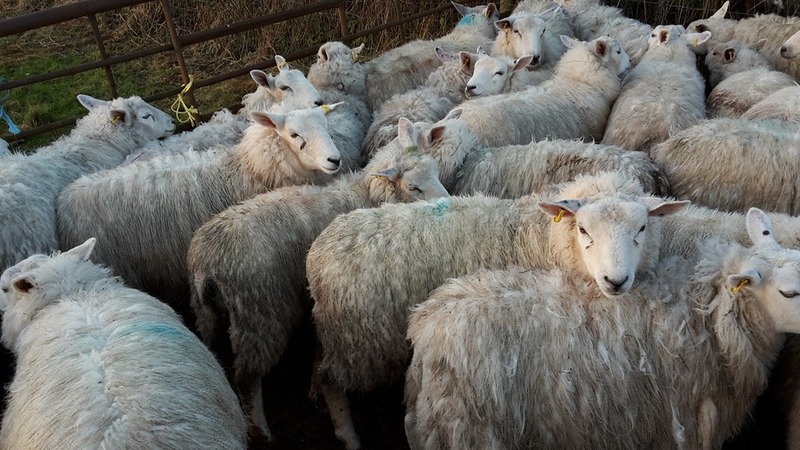 We prefer to only have animals for our own table rather than growing them and selling them on, so keeping the numbers small means we can supply our own meat without then having to get the excess numbers sold. It also means that all the sheep can fit comfortably in their barn at night without all being squashed up. They are spoilt I think! But then they give us good meat! I'm lucky as I have some land at my fathers farm I can over winter them on. I would only have about half the sheep otherwise. No night time barn here though - they have to brave the weather - it's what they were bred for! The rain has taken its toll on livestock up and down the country I think this will see a rise in meat prices in the shops, we are looking to picking up some lambs this spring to bring on to market, now I saw a brilliant idea I want to try for an easy outbuilding on facebook will send you the link although you may have seen it. That is a great shelter! although not big enough to have sheep in any quantity it would be great to store hay and straw in. ThanksDawn! Our lambs were poor last year, partly the breed and partly the grazing I think. We cut our losses and took them to the butcher "Not up to your usual standard Mrs H" No s**t! We buy poddy lambs in early spring , bottle feed and then creep feed and they are usually ready for October. I'm glad we haven't had ewes to overwinter as our paddock would have been badly poached with all this rain. Good luck with your butchering. I always do my own butchering to ensure the joints are the right size for us. I'm glad I'm not alone although it's not good for you either! The butchering should be a good adventure if I do it. I assume they have the brown mineral blocks over there, like they do here. You don't dare use the cattle variety, though. I think I'll mix some minerals in with their food so it won;t get washed away in the wet. Curiously the price of lamb here is down. I recently stocked up on 8 smaller legs for less than 4 $ a pound. Some locally grown in the 4-H program and some imported from Australia. Be sure to post about the butchering part. Should make for an interesting post. The killing and butchering will be interesting, might raise the neighbours eyebrows! just tell them you are Greek! and stick one on a spit in the front garden. It's worth trying a vendeen ram on your ewes, or changing to pure breds. They are the ideal smallholder sheep. Medium sized, easy to handle and will follow the bucket. Delicious meat which doesn't run to fat and they are quick to finish. I've gone for texels this year but I'm keen to try to get a few pure breed ewes at some point and try to breed a good flock. Don't be too hard on yourself, you've had a lot on this year. A polytunnel would be a cheapish and quick solution. If you give it a deep wooden 'skirt' on the inside it would be a bit stronger for the lambs too, in case they lean against it a lot and last you a couple of years longer. It's not being hard on myself but I need to do what works here, my time is valuable and I need to make something from it. I could use pallets for the bottoms, that would give good air flow as well. So sorry that you still have the lambs. 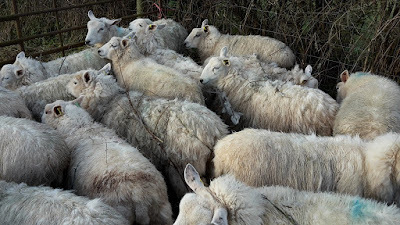 They are a fickle animal... you know my thoughts on sheep. Lots of work for not much return when you total up the man hours spent checking them and their feet. their feet problems alone are enough for me to not ever have any. I wouldnt even have a pet one. saw this and thought about how with your skills you could make something like this to sell as an attachment to the back of a door. maybe for utility rooms? what do you think? They certainly fickle! No need to feel sorry though, it's my own making, I should have kept on top of them better. If I had my van sorted earlier in the year I might have got some sold. What was the link Sol, It hasn't come through? ha ha I am loosing my mind. will find it and add it. I remember the blog. I will just have to find it. I thought maybe you could cut the parts for this to be made flat pack. people put together on their own and add them to the back of heavy doors.